Even though an annual campus tradition was hit with unexpected rain, the weather did not stop Rider students from enjoying a fun Friday night. This year’s fourth annual Rock Fest, hosted by the Student Entertainment Council (SEC), was held on April 12 on the campus mall. Current students, alumni and the local community were welcome to enjoy live entertainment and food provided by the SEC. In past years, Rock Fest featured activities such as a ziplining, lawn games, a wrecking ball and rock climbing. 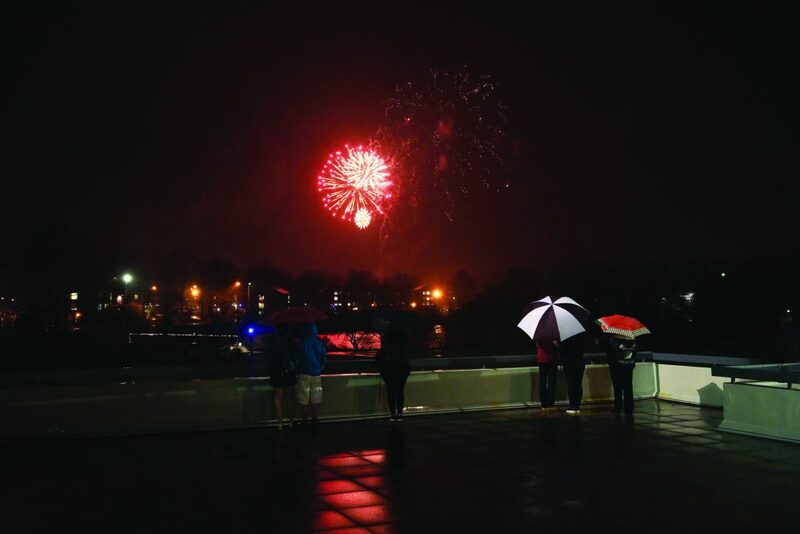 Although many of those events could not take place as originally planned due to the rain, Rock Fest still brought a bonfire, food trucks and fireworks to campus. Jewels Essis, a sophomore dance major, was slightly disappointed the weather conditions did not allow for the rock climbing wall, but enjoyed snacks that were provided to event-goers. “I wish they had rock climbing, but my favorite thing they had this year was the kettle popcorn because it was nice to have after a long week,” she said. Along with the kettle popcorn was free ice cream, funnel cakes, sandwiches, hot dogs, hamburgers and salads provided by the Bronc Bites food truck. The live entertainment still performed as scheduled, but under a tent. This year’s entertainment was performed by the band Nowhere Slow. The fresh faces at Rock Fest included freshman criminal justice major Stephanie Garcia Diaz, who loved the live entertainment. “Being able to jam out to music with my friends was really fun, especially with it being my first year attending Rock Fest,” she said. With the help of the SEC and local firemen, event-goers were able to enjoy both a bonfire and a fireworks display, which were shown at the end of the night. Alumni raved at the success of the event. Janelle George, a 2018 graduate, said the band and the food were the best parts of this year’s fest. Despite the rain, Rock Fest proved to be an exciting event for many members of the Rider community.